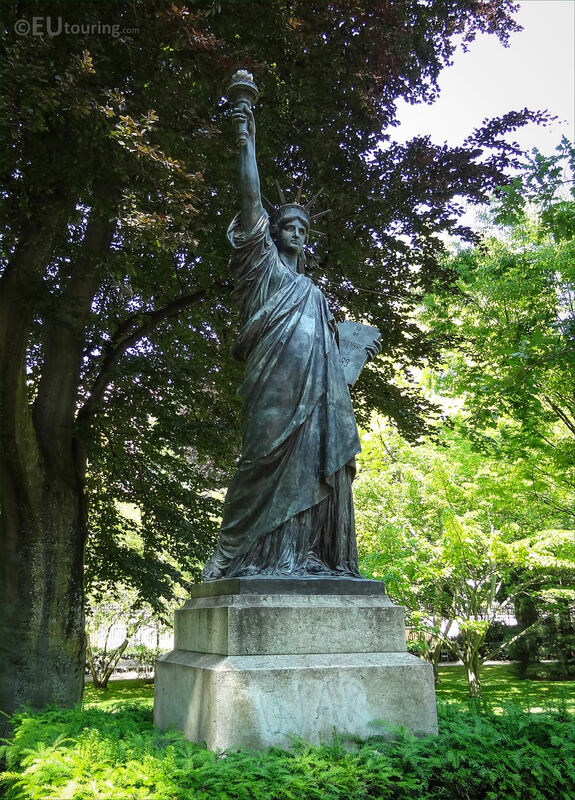 This time while we were within the Jardin du Luxembourg in the 6th Arrondissement, we took these high definition photos of the Statue of Liberty Enlightening the World, which is a bronze replica by Bartholdi. 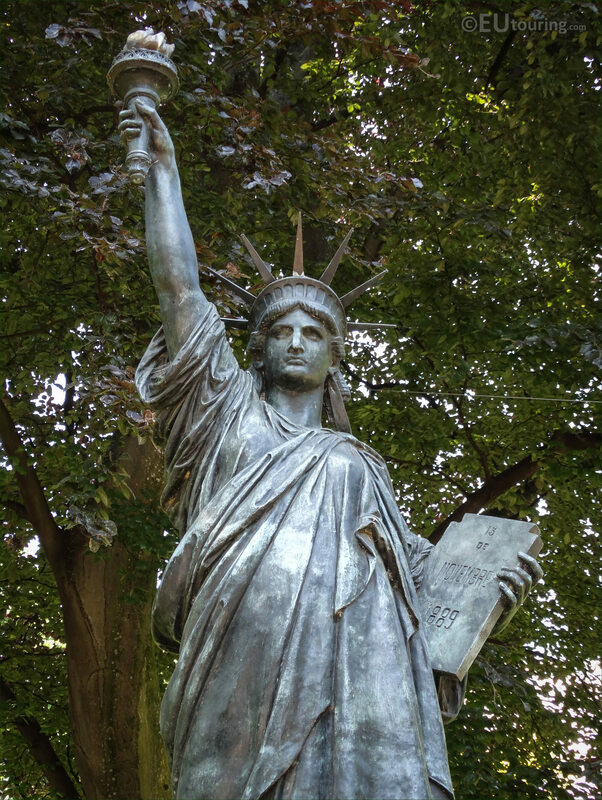 This first HD photo shows the full replica of the Statue of Liberty on its base, and standing at 2.9 metres high in total, this is referred to as La Liberte Eclairant le Monde, which is the official name of the monument that translates in English to Liberty Enlightening the World, and this was designed and produced by the French sculptor Auguste Bartholdi. 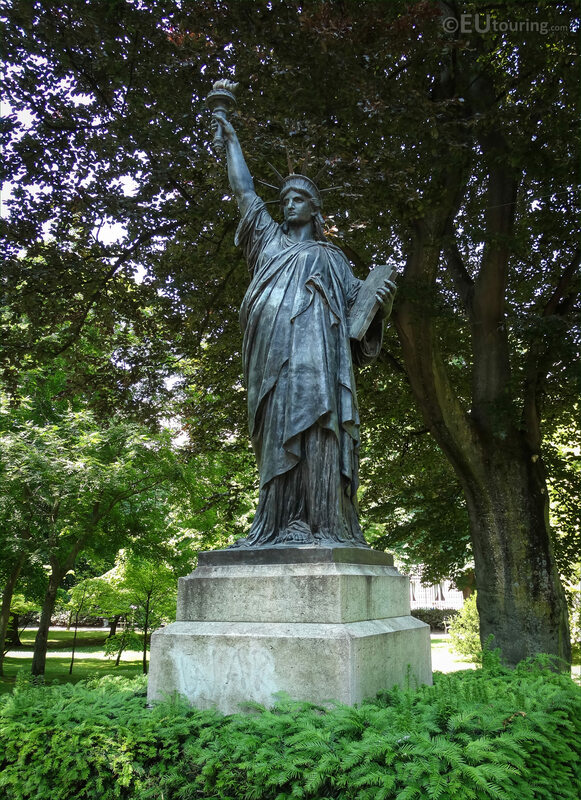 Now this is scale model of the full size Statue of Liberty that can be found at the entrance to the New York harbour, and was presented at the 1900 Universal Exhibition in Paris, then Bartholdi gave the bronze statue to the City of Paris for it to be placed within the Musee du Luxembourg, which is where it remained until it was decided in 1905 that it would be placed within the Jardin du Luxembourg for anyone to be able to visit for free. 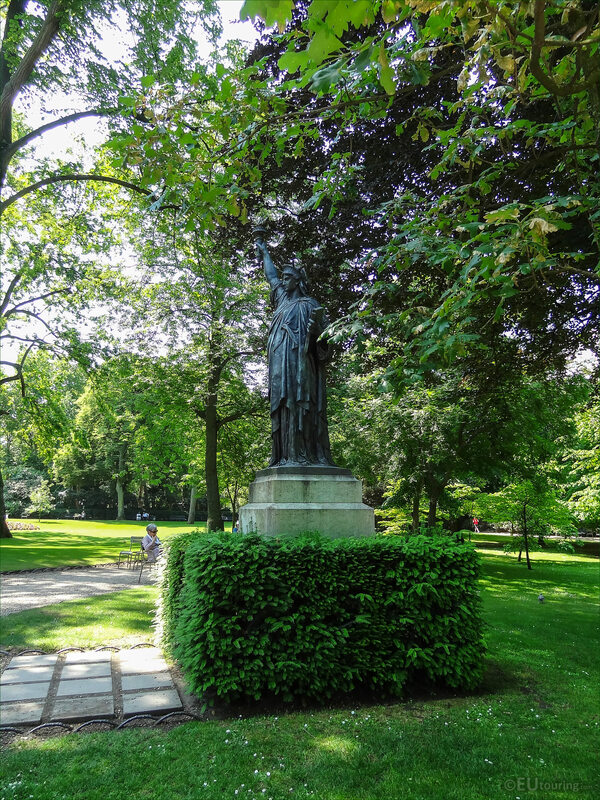 Although, you will find that the Statue of Liberty located in America was made of copper and Auguste Bartholdi asked the engineer Gustave Eiffel to help with the stability structure and construction of the enormous monument, yet he is most famous for designing and building the Eiffel Tower, but the smaller version you can see here in Paris is made of bronze. 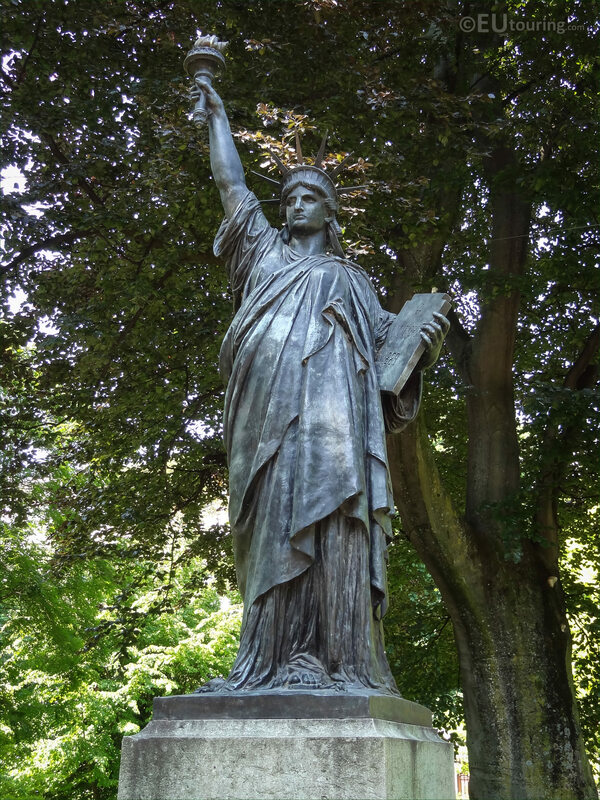 And in this close up photo you can see the famous liberty flame along with the tablet held in her opposite hand, and the one in New York has JULY IV MDCCLXXVI written on it, which is the date of the US Declaration of Independence, whereas this tablet has the date showing as 15th November 1889, which is when the larger Parisian replica was inaugurated. 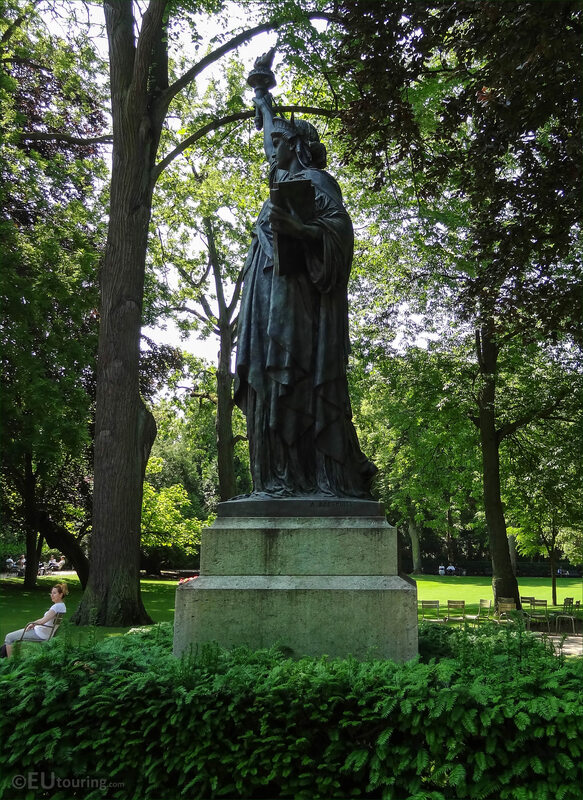 However, the official inauguration of the main monument in New York was on 28th October 1886, plus you will find that there are many different symbols on the statue that was designed by Frederic Auguste Bartholdi, such as the crown that has seven rays, to depict one for each continent. 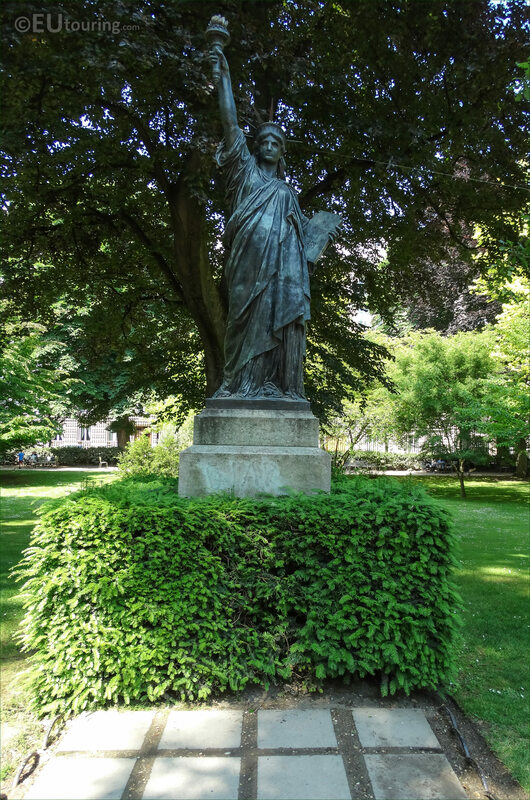 Yet The Statue of Liberty Enlightening the World you can see here, was in place until 2012 within the Luxembourg Gardens, however, it was decided that for conservation reasons it would be replaced by a bronze replica, and the original replica by Frederic Auguste Bartholdi is now exhibited at the Musee d'Orsay in Paris, so as to keep this preserved for many years to come. 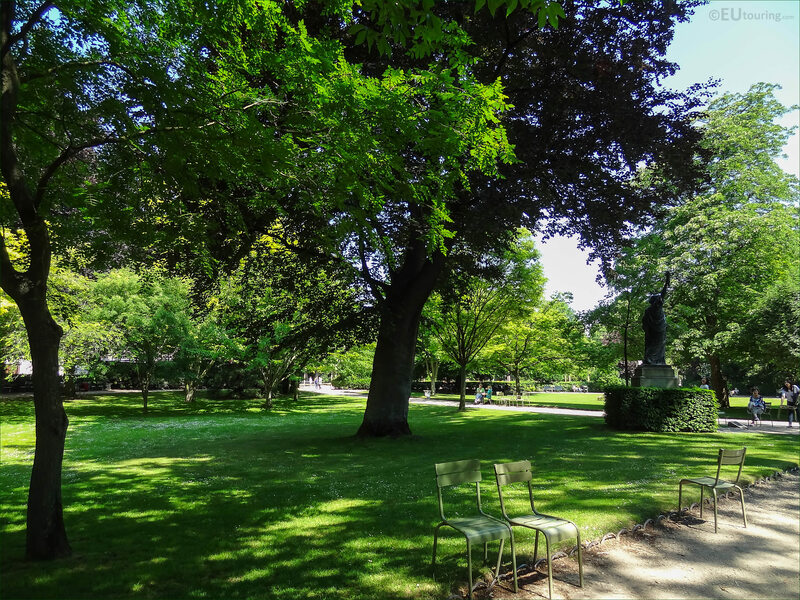 You will find that the Luxembourg Gardens in Paris is visited by millions of people each year, and even while we were there, different tour groups were discovering the many statues and monuments, and this replica of the scale model of the Statue of Liberty Enlightening the World, is one of its main attractions. And the monument was the original idea of Laboulaye, which inspired Frederic Auguste Bartholdi, who was born in Colmar in 1834, yet moved to Paris with his mother and studied architecture and painting, but later turned his attention to sculpture, producing many monumental statues such as the Lion of Belfort, but his most well known work is the Statue of Liberty, that took up a great deal of his time over many years. 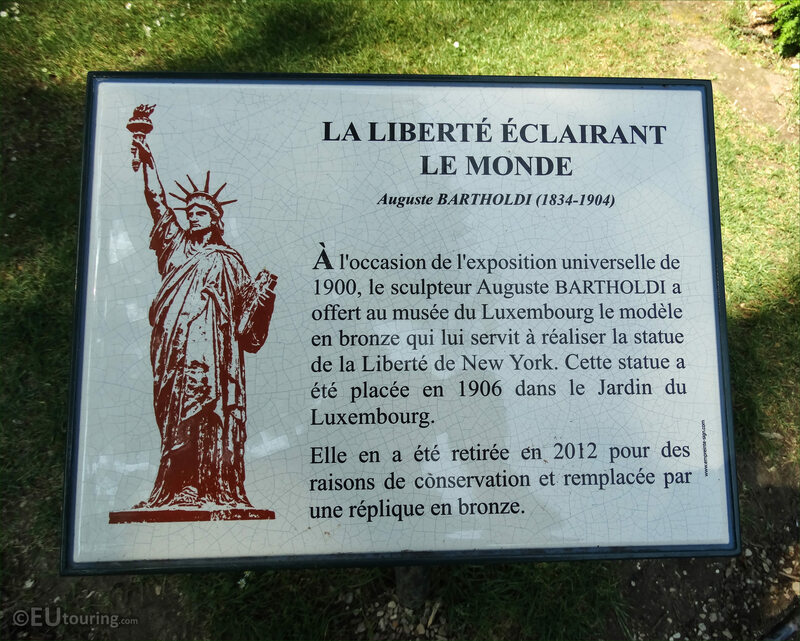 And here you can see the plaque located next to the Statue of Liberty Enlightening the World, or in French, La Liberte Eclairant le Monde, and as you can see, the replica produced by Auguste Bartholdi was placed within the Jardin du Luxembourg garden in 1906, two years after he died of tuberculosis, but it was replaced with a bonze copy in 2012. 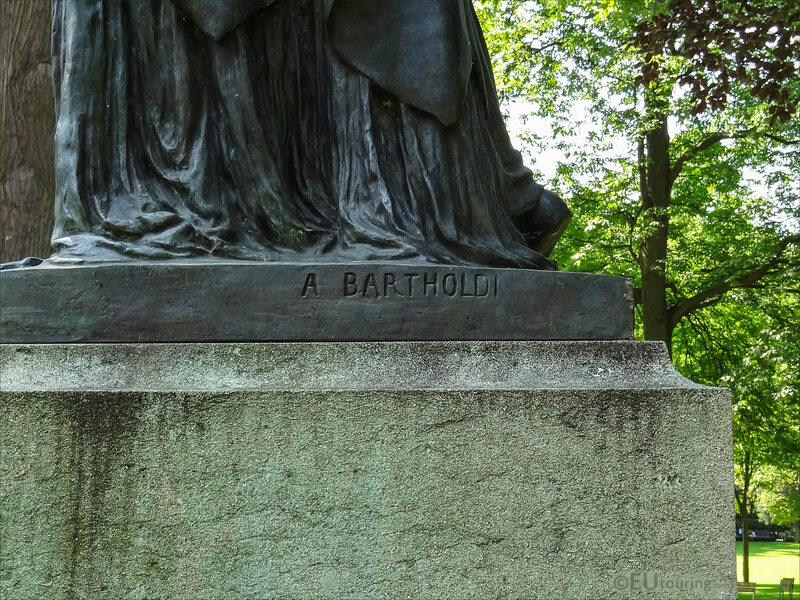 But although the French sculptors full name was Frederic Auguste Bartholdi, as you can see from this close up photo, he used to sign his name A Bartholdi, and this was inscribed onto the base of the bronze statue on the left hand side of the figure, and almost 100 years after the original had been completed, French and American engineers, architects, etc still worked together to restore the Statue of Liberty to its former glory. This close up photo shows a plaque located right by the replica of the Statue of Liberty, and this is is because there is an American oak tree right next to it, and one of the captions reads; This American oak is dedicated to the memory of the victoms of September 11th 2001 in the United States of America. 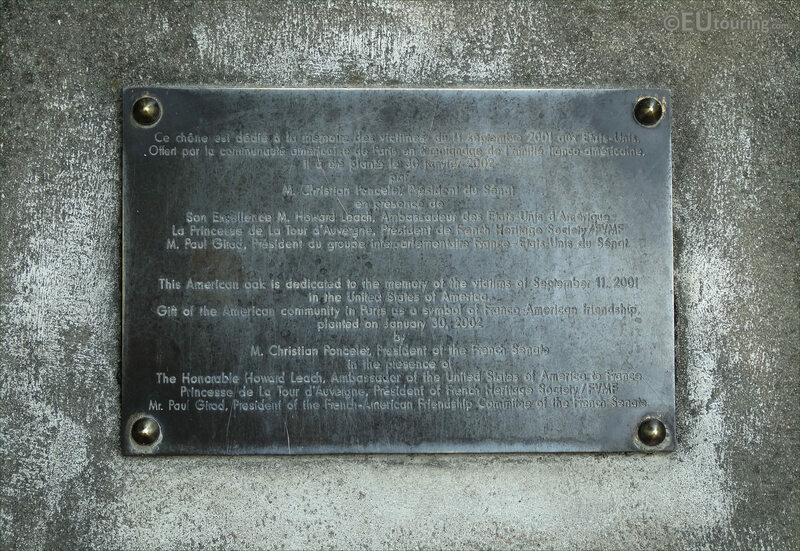 Gift of the American community in Paris as a symbol of the Franco-American friendship planted on January 30th 2002. 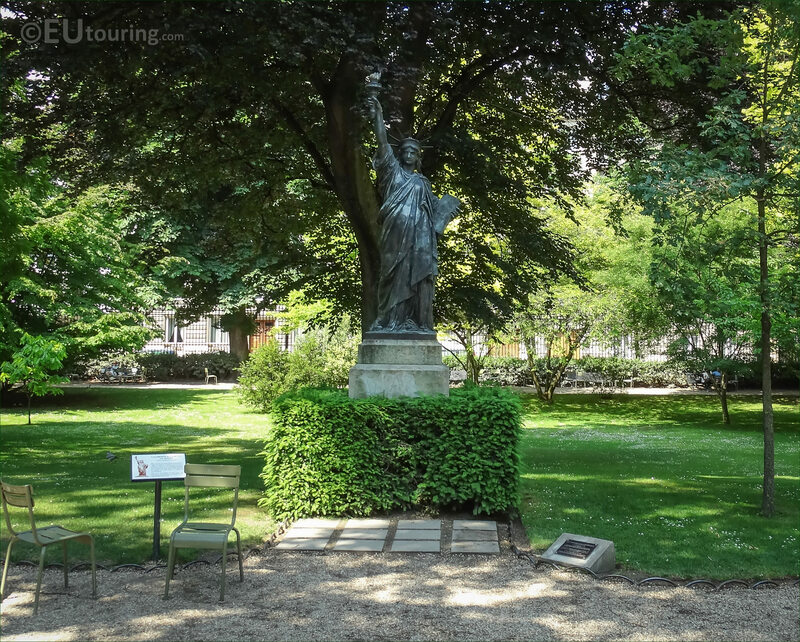 But this HD photo shows the position of the Statue of Liberty with the two plaques either side, and the American oak behind, and this is located on the western side of the Jardin du Luxembourg close to the perimeter by the Rue Guynemer that you can see in the distance in this image, but there is also another Statue of Liberty in Paris you can discover, which is located on the Ile aux Cygnes island.